Working on your own car at home is a great way to save money and gain a greater understanding of how it works, but there are some essentials you need for safe and efficient maintenance. Axle stands are an effective and inexpensive way of raising your car off the ground, allowing easy access underneath and most importantly keeping you safe. Here are ten of the best axle stands on sale now. 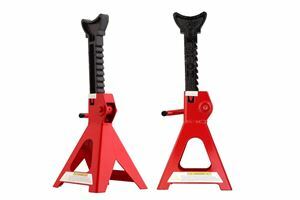 These axle stands from Vigor tackle one of the main issues of using them to lift your car, namely that the jacking points on many cars have a sill seam running through the middle of them. 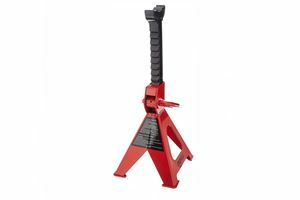 The jack supplied with your car will have a groove set into it so you don't damage the seam, but many aftermarket stands and jacks don't have this groove. Vigor has seen through the problem and fitted rubber pads with a groove in them, allowing you to raise your car and keep the seam intact. The downside is that they don't offer a ratcheting mechanism, but they are still good value. 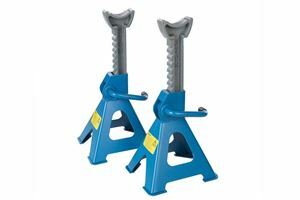 Draper are well-known and respected for producing solid and dependable tools at a reasonable price and these axle stands are no exception. A generous load rating of three tonnes should cover most eventualities, and they have a ratcheting mechanism that makes it easy to lift and adjust the vehicle height. 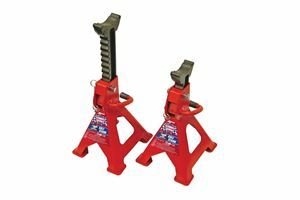 A shaped saddle means reassuring stability once your car is raised, and Draper offer a range of jacks and wheel chocks too so you can source all your lifting equipment from one supplier. As a secure method of keeping your vehicle off the ground, axle stands are the next best thing to a hydraulic hoist. 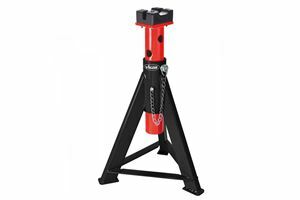 The main downside however is that they can take up quite a bit of space and are not particularly portable, but these stands from Sealey tackle that problem thanks to their folding design. Fitted with a shaped saddle for security these Sealey stands do without a ratchet mechanism, but that helps to keep the cost low. 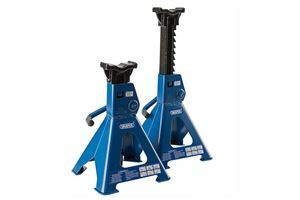 If you have the unenviable task of raising a heavy vehicle off the ground then these stands from Vigor are up to the challenge. Rated to an impressive six tonnes, the V2477s come with the same rubber-protected saddles as other Vigor stands, allowing you to raise the vehicle in axles or seams without damage. Capable of reaching a height of 575mm for excellent access, the Vigor V2477s also include a two-year warranty as standard. 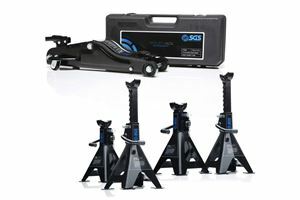 A perfect package if you are starting your garage equipment from scratch, this set from SGS Engineering is made up of a slimline jack and four axle stands rated to two tonnes. Each of the axle stands is fitted with a ratchet system for easy adjustment and backed up by a locking pin for added peace of mind, while the whole kit comes with a two-year warranty. As a low-budget option that still includes the most-desirable features, these axle stands from Silverline are an excellent choice. Featuring a ratcheted adjustment mechanism for quick and easy installation, they are also rated to three tonnes, a useful boost over the more common two-tonne rating. Search around and you may be able to secure a set of four stands for around £40, giving you the option to lift a car completely from the ground - perfect for anyone working on a long-term project. They also come with a lifetime warranty if you register your purchase via the Silverline website. These reasurringly-named axle stands from Faithfull feature the desirable ratchet mechanism to allow easy adjustment which is also backed up by safety pins, adding a welcome extra layer of security. 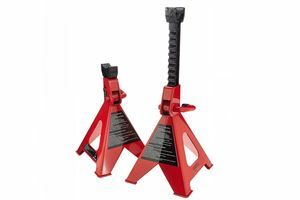 Unlike many rivals at a similar value price these Faithfull stands are also rated to three tonnes, making them suitable for larger passenger cars and vans. 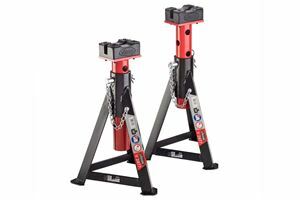 One of the most affordable axle stand sets on the market, this pair from AllRight are ideal for owners who need something for occasional use. The are fitted with a ratchet adjustment mechanism and come with a two-tonne load rating, making them suitable for most family cars. They can also deliver a height of up to 430mm with a saddle design giving maximum support and security. 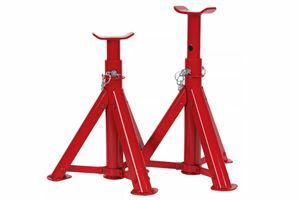 Frequently offering the least-expensive product on the market, Amazon's Basics range includes these 1.8-tonne axle stands. Perfectly suited for smaller cars and occasional use, despite the price these stands come with the desirable ratcheting mechanism and saddle support. A two-year warranty is included and if you keep a close eye on prices you might be able to secure a pair for less than £20. Another offering from Amazon Basics, but this time aimed at the serious home mechanic who needs to lift heavy vehicles or needs to keep a car completely off the ground in the long-term. Rated to a hefty 5.4 tonnes with a secure saddle contact point, they also feature the crucial ratchet mechanism to make short work of height adjustment. A two-year warranty is also included as standard.